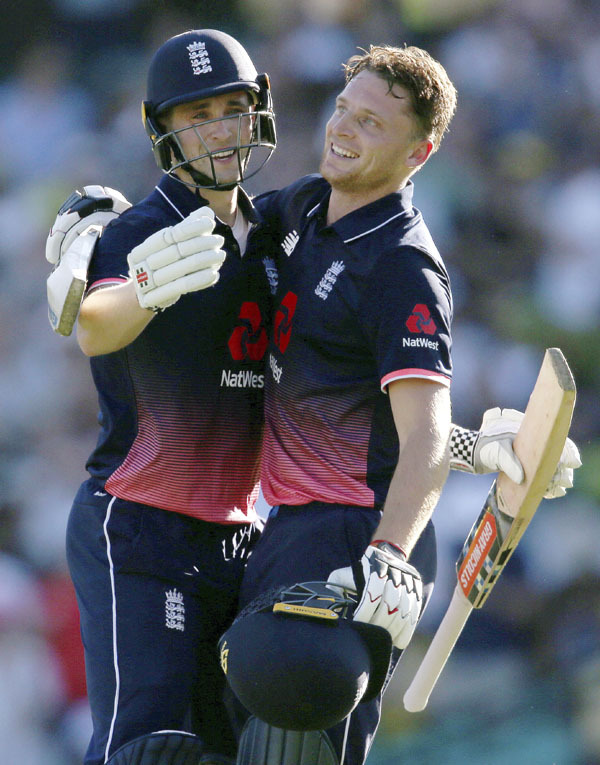 England\'s Jos Butler, right, celebrates with batting partner Chris Woakes after Butler made 100 runs against Australia during their one day international cricket match in Sydney on Sunday. A scintillating century from Jos Buttler brought England a 16-run win and a one-day international series victory against Australia in Sydney on Sunday. The hosts, set 303 to win by England after winning the toss and electing to bowl, were always struggling in their chase and eventually managed only 286 for six. The result gave England an unbeatable 3-0 lead in the five-match ODI series, a remarkable turnaround after Australia had trounced the tourists 4-0 in the Ashes Tests. Australia's hopes largely rested with Steve Smith (45) and Mitchell Marsh (55), but both were dismissed at a crucial stage of the chase, with Smith falling to a contentious low-down catch by Buttler off the bowling of Mark Wood (2-46). Marcus Stoinis made a late attempt to lift Australia with a punishing 56, but England managed to hold on despite losing pacemen Liam Plunkett to a leg injury early in the Australian innings. Buttler, 27, was the only batsman from either team really to get to grips with a slightly slow pitch, and his late surge enabled England to reach a total which had seemed out of their reach until the final few overs. Several English batsmen failed to capitalise on promising starts, but Buttler notched his fifth one-day international century from the last ball of the innings as England helped themselves to 38 off the final two overs. Buttler himself took 28 runs from the last 11 balls he faced. He faced 83 balls, hitting six fours and four sixes, in a dashing innings that gathered momentum in the last 10 overs. Just as England appeared to be struggling against a full-strength Australian attack, Buttler found a willing ally in Chris Woakes late in the innings, the seamer making 53 from 36 balls in a match-winning partnership of 113 in 11.5 overs. Australia recalled pacemen Pat Cummins and Josh Hazlewood for the match, the first time in the one-day series that the trio of Cummins, Hazlewood and Mitchell Starc, who spearheaded the Ashes win, had been reunited. The tactic appeared to be working until Buttler and Woakes came together and turned the match on its head. The English were aided by sloppy Australian fielding, with four missed catches and two botched run-out attempts.